LG 55LW650T review | What Hi-Fi? This LG is unusual in that it uses passive 3D technology, rather than the more usual active-shutter type favoured by its rivals. While active 3D has its advantages, the glasses used are costly and relatively heavy. Passive 3D technology uses a polarised image which is sent to each eye via inexpensive, lightweight glasses. The downside is that the resolution seen by each eye has to be halved. Spin Despicable Me in 3D and you do notice a slight drop in detail and sharpness when compared with an active system. Images don’t display quite the same brilliance and depth. On the plus side, there’s no sign of crosstalk (ghosting on the image) and your eyes don’t feel as strained as they can when watching an active system. And, the low cost of the glasses means you get seven pairs included with the TV! How’s that for value? There’s also value to be had on other areas of the TV’s performance. Switch to Fast Five on Blu-ray and detail levels are more than acceptable for the money. Character outlines are sharply drawn and there’s no major trace of on-screen noise. There’s decent level of detail in shadows, although you can get darker, deeper blacks from other sets. The LG can’t quite summon the finer subtleties and the silky smooth motion processing of the top sets in this class, but it still shows enough skill (with DVD upscaling too) to make the price very tempting. The Freeview HD tuner compares very favourably with the Panasonic TX-P55VT30, the top TV in the group and one of our 2011 Award winners. It’s arguably the highlight of this TV's portfolio and despite a touch of instability with movement, sharpness, detail and colours are all displayed to a high standard. Flatscreen TVs still have quite a way to go to match their CRT forebears for sound and, indeed, the LG’s two, 10W speakers sound crashy and splashy. We’d recommend listening at low volumes, or, preferably, easing the burden with a dedicated sound system. LG’s on-screen menus lack a little sophistication, but they’re still larger-than-life and easy to read. You’ll need to experiment with LG’s True Motion picture processing to reach an agreeable level of motion handling, but set-up is relatively straightforward. it feels vague and thumb-unfriendly when used to cycle through the various menus. You might want to consider swapping it for LG’s optional ‘Magic Motion’ remote, a Nintendo Wii-style point-and-click device. LG’s Smart TV functionality works well, even if its menus aren’t the most intuitive or helpful. You can access the likes of iPlayer to stream video and, if you’re feeling particularly sociable, Facebook. You can also browse through LG’s own App Store if you find yourself at a loose end – but don’t expect too much in terms of quality. 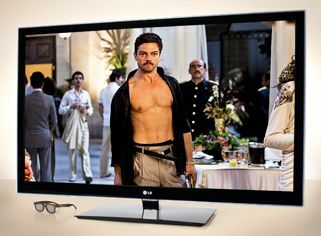 Its picture quality can’t quite match the very best at this screen size, but this LG still represents exceedingly good value and is definitely worth a punt.